Recently I took out Momofuku Milk Bar’s cookbook from the library and it’s been my preferred bedtime reading as of late. I cannot stop looking at all of the crazy concoctions in this book and keep adding things to my “must make” list. First up? 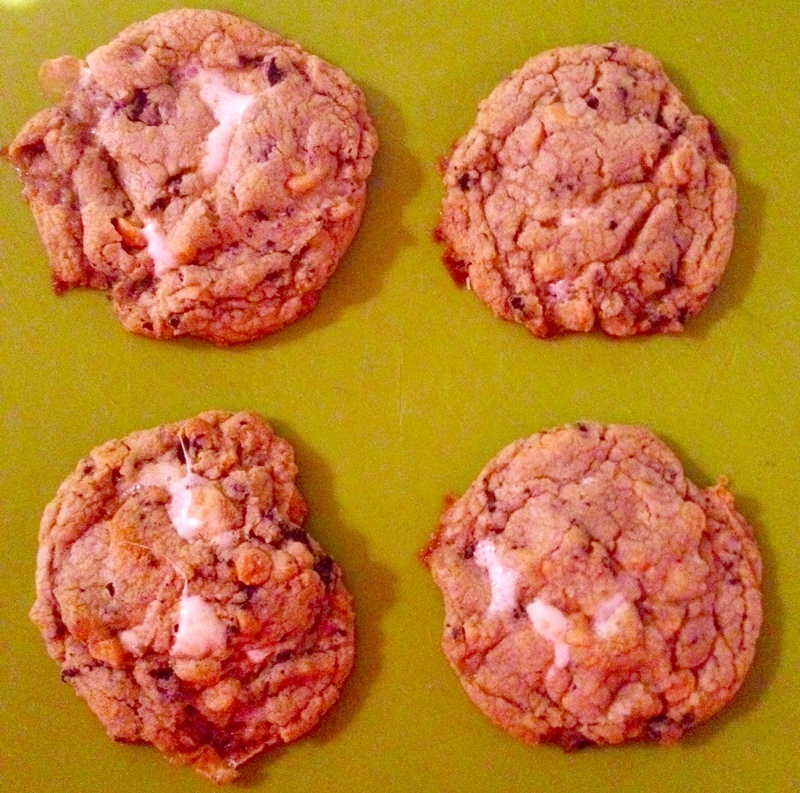 I have been totally salivating over the Cornflake Chocolate Chip Marshmallow cookies. I LOVE marshmallows but I had always assumed that putting them in cookies would just make a mess. One look at the ooey-gooey melt-y marshmallow in those cookies in the cookbook though, and I was sold. However, I was sorely lacking in regular chocolate chips and cornflakes so I improvised with a bit of a pantry clean out and these were born. Salty peanut butter chips. Crunchy, creamy Oreo chunks. And the fluffy, gooey marshmallows. All baked into chewy, golden cookies. Pour yourself a glass of cold milk and you’ve got it made. Line two large cookie sheets with silpat or parchment and set aside. Stir together the butter & sugars until well mixed. Chill the mixture for a few minutes until it comes to room temperature. Stir in the egg, egg yolk & vanilla until combined. Stir in the flour & baking soda until dough forms. Stir in the Oreo chunks, peanut butter chips and marshmallows. Using a ¼ cup measure, scoop out dough balls onto the prepared cookie sheets. Put the cookie sheets with dough balls into the fridge to chill for at least 30 minutes. When ready to bake, preheat oven to 350 degrees. Bake the cookies for 12-14 minutes or until starting to turn light golden brown. Do not over bake! Let cool for several minutes on the cookie sheet, then finish on a cooling rack. Once cooled, store in an airtight container. Serve with cold milk! Make sure to scoop the dough into balls BEFORE chilling it. This dough gets very hard when it chills, making it nearly impossible to scoop after. I highly recommend using a silpat or parchment paper to line your cookie sheets for this one. The marshmallow oozed out of some of the cookies and got quite sticky and hard.